EatDrinkMedia.ca: Beer on Twitter, 200km around Vancouver. Who's listening? Beer on Twitter, 200km around Vancouver. Who's listening? At EatDrinkMEDIA.ca we're keenly interested in the "local food, local beverage" market, particularly with how people are telling the story of local food in our primary region, Vancouver Island. But sometimes it pays to look a little further afield. Another word cloud?You'll see a word cloud. But not just another word cloud. 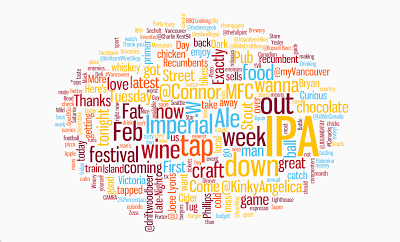 This is a word cloud that updates as people tweet about beer within 200km around Nanaimo. This is a word cloud that you can "drill" into: Clicking on words or "re-clouding" on words helps us understand the jumble. Filtering words out using the dictionary function helps to clarify the image and identify key themes, ideas. If you're selling beer in the highly competitive BC market, you should be finding this kind of tool very useful. The work we do through EatDrinkMEDIA.ca is all about "good food, local food." Mostly we focus on what's happening on Vancouver Island. 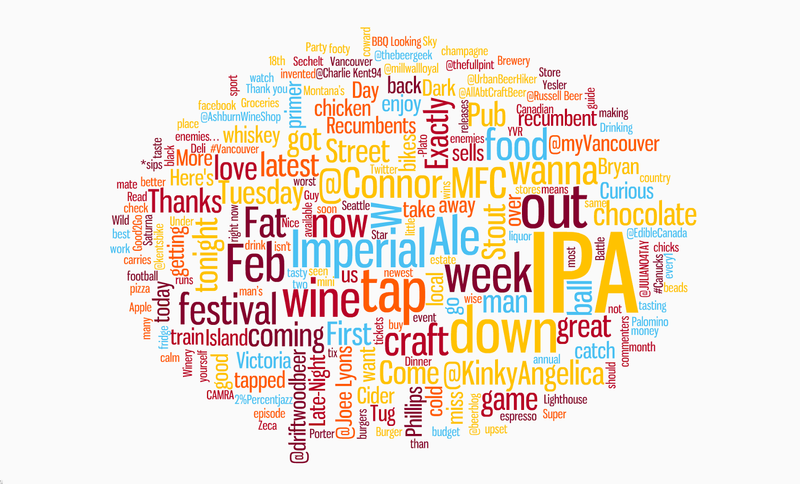 Right now – February 2013 – we're asking people to tell us about their Vancouver Island local beer experiences. EatDrinkMEDIA.ca is about using various media channels and survey tools to find the Vancouver Island good food, local food story, and then help spread it around. Using tools like SayZu as part of our "social media command centre" (see more about what that means at this Hootsuite webinar) means we can capture images of online chatter, and then drill down to see what's important: Not only who's saying what (Hootsuite does a great job of that - hat's off to them! ), but what's the mood, what are the dominant ideas/memes in the chatter. Knowing the dominant ideas/memes helps us to understand both how to tell the story of our clients, but also to respond. We can answer areas of concern. We can help celebrate good news, good feelings. We can see what's important to people. And that, from a social media management perspective, especially given the "firehose of information" that hits whenever you turn on the faucet, is very important.